Nothing like applying for life insurance to make you consider your own mortality. Today I spent 30 minutes on the phone, completing an interview with a life insurance company so they can decide how risky I am and thus, how much the insurance will cost. The initial questions -- about things like cocaine use and bungee-jumping and piloting airplanes and international travel -- simply reminded me how very boring I am, as I answered "no" to every question. But then, as the interviewer listed through scores of health problems and medical conditions (to which, thankfully, I mostly also answered "no") I began to think about why we're getting life insurance policy for me. Two reasons: Junius and Pippi. My husband (bless him) is the primary bread-winner in our house these days. Although I make enough money on contract work to pay for preschool, it's his salary that keeps us afloat. But what I don't earn in cash, I make up for in fixing lunches, changing diapers, wiping noses and entertaining toddlers -- and those things aren't free if Mommy's not around. So instead of relying on the grandmothers to move in and care for our kids (no offense, Nanna and Nonna, but not sure that's a good solution for anybody), we need a way to pay for childcare and other supports if I'm gone. And there, I said it: If I'm gone. Makes me want to stop writing and go vomit. All I know is that I hope this is like carrying your umbrella so it won't rain. By having this insurance policy, what I'm really trying to ensure is that I'll be around a very, very, very long time. Mothers-in-law get a bad rap. I won't admit to complaining about mine since she reads this blog, but I hear plenty of stories from friends about their crazy, although generally well-intentioned MILs. I actually get along pretty well with my husband's mom -- she's kind and smart (and allowed to be a little crazy from time to time, given that she had four children under the age of 7 by the time she was 25). But we spend a lot of time and energy dancing around in an effort to be overly agreeable with each other, which often makes mountains out of mole hills for no good reason. I'm not sure why we do it and we've even tried to joke about it, but somehow it's hard to let go and trust that we'll be fine by just being ourselves. One of her favorite things to do is shop, especially for bargains. She'll often call from a great sale to ask if we need anything, and she rarely shows up for a visit without some gem for the kids from the dollar bin. So earlier this week, I took her up on her offer to pick up purchases for us at JC Penney, since she gets an extra discount there. I sent an email with detailed info about our purchase, being sure to be polite and not impose and all those things she and I do to make a small request longer than necessary. A few hours later, her email reply arrived -- with just the laugh I needed to remember that she and I can both relax. Your order has been received. You shall hear from our local shopping center within the next 24 hours to see if either set is in stock. Thank you placing your order with us. You are a valued customer and we appreciate your business. I started blogging because it seemed like the thing to do. And because I was inspired by my cool neighbor across the street, who is a great writer and friend. But I'm discovering this whole entire world (apparently called the "blogosphere"?) that I didn't know existed. I mean, I knew people were writing blogs -- but I think I assumed it was mostly political junkies and sports fanatics and moms posting goofy pictures of their kids. Had no idea it was full of witty, clever, talented women writing about life and politics and motherhood and families and food and fashion and husbands and whatever else we might think of. I'm a working-from-home-mom of two -- my son (called Junius here) is 3 1/2 and my daughter (called Pippi) just turned 1. Living in North Carolina with my husband -- we're just about the only two people who grew up Catholic in N.C. in the 70's who are still Catholic and living back in N.C., so it's lucky we found each other (although we're both pretty frustrated with the captial "C" Church these days). I'm a Tar Heel born (almost), bred and graduated twice, so these days we're watching a lot of basketball. A "retired" high school English teacher, I've worked in public education advocacy and now do research consulting work for education organizations. Which is probably why blogging seemed like a good idea -- a chance to write something from my heart and head instead of from test and tracking data. For the Blog Party, they're giving away lots of cool prizes... I'm hoping for the ergo baby carrier (#7 -- I found it to be the best way to wear a baby), a $50 gift certificate to Target (#19 -- who can't spend $50 at Target?!) or a $25 certificate to Shutterfly (#99 -- because I don't have any kind of baby book or photo album for my 1-year-old. oops.). If anyone has actually wandered over from the UBP, welcome and thanks for reading! Hope that I can keep you entertained for a bit. I've had two moments in my life when I was strangely certain of something that I couldn't possibly know. One was when I found out I was pregnant for the first time. I peed on the stick, waited, looked at the little lines magically appearing in the window, and knew immediately that I was having a son. I can't explain it, but it was just the first thought in my head. It was clear and loud -- and it turned out to be accurate. The other odd moment of clarity and clairvoyance happened some years earlier, one sunny August day on the steps of Carroll Hall at UNC-Chapel Hill. It was my second day as a master's degree student, and I'd just introduced myself in the hallway to the handsome Ph.D. student who was teaching the Intro to Public Relations class I'd attended the day before. 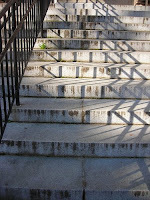 As I bounced down those steps into the sunshine, I thought, "I have met my husband." Six months later, we were engaged. Six months after that, we were married. When you know, you know. 3. Vanilla yogurt with berries and granola -- layer it in a parfait glass for a fancy dessert or dump it in a cereal bowl for a snack. It's versatile, tasty and healthy. And a little addictive, but maybe that's just me. 4. Pandora -- it's free music at your fingertips and a great way to discover artists you love that you've never heard of. Just type in your favorite bands and listen. 5. Sherwin-Williams paint -- Duration Home goes on smooth, has low VOC/odor, inhibits mildew and comes in any color (my favorite is the "sleepy blue" we used in our bathroom) . Plus the store will set up an account for you to keep track of the colors you buy, so you don't have to. 6. Picasa -- Google's free software lets you store, organize, export and email your photos and video clips with ease. And it's easier to use than Photoshop for quick fixes like cropping, removing red-eye, adjusting color/contrast or converting to sepia or black-and-white. We recently interviewed to be on the TLC show Home Made Simple. A friend in the neighborhood knew they were looking for families in Raleigh and we volunteered to try out. The show's producer (a very nice guy named Mike) came over on a Friday evening with his video camera to shoot the house and us talking about our home and our life. It's a strange thing to talk about "our story" on camera, trying to think about whether or not anyone would want to see us on TV. And it's awkward to try to look nice and sound witty while also fixing dinner and feeding two small children, but we did our best. Goodness knows we could use the help with the house, so it's worth a try. Mike: So is there anything you'd like to learn how to make? Husband: Crepes. [Excitedly. ]I'd really like to learn how to make crepes. Me: [Looking incredulous.] You mean, using the crepe pan that we got as a wedding gift seven years ago that's still in the cardboard wrapping in the way way back of the cabinet? Me: [Looking stunned and slightly pained.] Oh my gosh. If I really wanted to woo my husband, I'd learn how to make a delicious duck dish. [Yes, I'm that alliterative when I talk -- probably too much time teaching English and reading Dr. Seuss.] This is terrible! Can you cook duck in a crockpot?!?! So now I'm ruined. Me -- the girl who until very recently refused to touch raw meat under any circumstances. Me -- the girl who could live just fine on cereal and milk three times a day. Me -- the girl who sometimes serves her kids an all-orange meal (chicken nuggets, sweet potato fries, carrots and mandarin oranges) and thinks that's okay. Regardless of whether or not we get picked for the show, the idea is out there. I now have to learn how to cook duck. Depending on your age and your TV viewing habits, you may or may not remember a show from the 90s called Ally McBeal. At the time it first aired, I was the target audience for the show -- mid-20s, single white female, searching for true love and professional happiness. I followed the show religiously, grading papers while I watched in order to justify staying up past my high-school-teacher bedtime. I lived vicariously through Ally (played by the frighteningly thin Calista Flockhart, shown at left), sharing her pain and wishing I could wear those fabulous short skirts. I finally stopped watching when I was living overseas and didn't have a television (plus the UK version was a season behind), but I think the show jumped the shark while I was gone and I never went back. I'd forgotten about the show until this week, when I pulled out a Vonda Shepard CD for New Music Monday. Shepard provided much of the soundtrack for the show, and just listening to the first song suddenly took me back... Ally's continuous efforts to get over the (supposed) love of her life who had married someone else (and unfortunately worked in the same law office along with his new wife), her crazy boss who put up with (and sometimes contributed to) her own craziness, her desperate quest to find the right man to love, her often failed attempts to be good at her job, her biological clock not just ticking but dancing in front of her. Thinking back on the show made me so grateful for all the ways my life has changed since then... two graduate degrees, one husband, three internships, one long-term job, two babies, seven moves, three houses, one consulting gig, too many friends to count. Lots of chaos and plenty of challenges, but also hundreds of wonderful, beautiful and ordinary days. In many ways, I have less control over my life now than I did then -- my kids determine my routines more than I do and I don't remember the last time I even got to use the bathroom alone. And yet I feel like I'm making more conscious decisions these days, choosing to live in my craziness instead of trying so hard to get out of it. Believing in that doesn't always make me feel better, but it does give me something better than a skinny TV character to hold on to. Do babies come with by-laws? I went to my first babysitting co-op meeting on Sunday -- we met to formalize by-laws for the group, because apparently that's what you're supposed to do when you start a babysitting co-op. Basically, it's a group of neighborhood friends who would like to be able to have date night with their spouses without having to spend additional money on a babysitter. Because trust me, when you find a wonderful babysitter (and we are so fortunate to have one we love), you will pay whatever it takes to keep her. But that's fodder for another post. At the end of the meeting, one of my clever friends commented that reviewing our six pages of by-laws was like attending a childbirth class. You know, she went on, the class where they give you pages and pages of information about what to expect when you arrive at the hospital, all the details about your stay, how to install the car seat so you can take the baby home, when to call the pediatrician about concerns, and so on. But they don't even begin to prepare you for how to actually take care of the baby. "Children should be given loving care and proper supervision. Watch other people's children very carefully." That about covers it. Any questions? I'm not exactly sure when he crossed over, but somehow my baby boy has turned into a big boy. I guess it's been happening gradually, but in the past week there have suddenly been so many signs. Thanks to a recent growth spurt, he is now tall enough to climb over the baby gate at the bottom of the stairs without assistance. He had his first check-up at the dentist. All four of us were there (three for cleanings -- Pippi doesn't have enough teeth yet), so that we could take turns sitting with Junius. But when the hygienist called his name, he trotted on back by himself, climbed up into the chair and acted like he'd done this a hundred times before. And no cavities! He says he likes the movie Toy Story because it's scary. He can throw a frisbee well enough to actually play "catch" with his dad. (Not so much with me -- terrible at frisbee.) And he's fast on those long legs. We took down the safety rails on his bed -- he doesn't need them anymore. But perhaps the biggest sign incorporates two major accomplishments: potty training and learning to sleep through the night. A few nights ago, my husband and I heard a noise as we were falling asleep. When the light suddenly came on in the hall bathroom, we realized it was Junius -- he had climbed out of his bed without calling for anyone and gone into the bathroom. We listened, amazed, as he peed (standing up, no less), put his underwear and pajama pants back on, turned off the light, walked back to his room, climbed into his bed and went back to sleep. No assistance needed. But in spite of all this growing up, or maybe because of it, he's added a new regular saying to his repertoire that became an immediate favorite: "Mommy -- know what? I love you TOO much!" Like most parents, we've been working hard to raise our son right since the day he was born -- maybe even before then. We try to teach him about the big stuff, instruct him about the difference between right and wrong, help him to make good decisions, tell him about the importance of saving money and getting a good education. At our house, that means being brought up in the ways of Dean and Roy, of Hark the Sound and the Old Well, of Pepper's and Sunrise Biscuit Kitchen. We are a Tar Heel family, with three Carolina degrees between us, and we want to be sure our children understand the significance. We also teach him about the Pirates (he's very good at saying "Argh" for his father's alma mater) and the Hokies (his grandfather's alma mater), but even his Daddy and his PopPop pull for the Tar Heels in most settings. So it pains me greatly to share the following stories. The first sign of failure occurred last Thanksgiving. Shortly after arriving at the grandparents' house, Junius was playing with the old Fisher-Price cash register (those old-school toys are still the best) when my sister-in-law asked him what he was going to do with all his money. He promptly responded, "I'm saving it for college" (so far, so good on the parenting). But when she asked him where he wanted to go to college, he quickly and clearly replied, "NC STATE!" At first, I convinced myself it was a fluke, that he had the school names confused. Then I decided he must be spending too much time with our Wolfpack neighbors -- should have known those boys would be a bad influence. Now, it's happened enough times that I'm afraid he might actually mean it. Okay, so I'm willing to cede a little ground to N.C. State. I actually like the Pack, as long as they're not playing the Heels (or the Hokies). We know some very nice, smart, successful people who went to school there. And if he decides he wants to be a graphic designer or an architect or an engineer, I'm all for sending Juni to NCSU. But we draw the line at Dook. And we were pretty proud of ourselves for teaching him to say, "Boo Duke!" (although it sounds strangely like he's saying Bo Duke, as in the Hazzards, but I digress into my own childhood). There's even a Duke Street in our neighborhood and he says "Boo Duke!" every time we drive by. It was all going so well. And then we went into Omega Sports over the weekend. Junius saw the Tar Heel display and said, "Look, Mommy -- it's Ramses!" (very nice, focused on our mascot). Then he ran to the Wolfpack display and announced, "It's N.C. State!" (Okay, fine). But then, as he walked past the Blue Devils paraphernalia, he said, "Yea! Go boo Duke!" I think consignment sales are great for baby and toddler clothes -- especially in the first two years, babies grow through the clothes so fast that they hardly get messed up and it doesn't make sense to spend a lot on new clothes. Every time I go to a consignment sale, I think about all the things I have stored away in closets and the attic and I promise that next time I'll bring some items to consign. And so now that Junius is 3 1/2, I'm finally forcing myself to make good on that promise. Earlier today I started wading through the three large storage bins filled with baby boy clothes -- I've already passed along the generous hand-me-downs we received from friends, but there were plenty of things left that seemed like good candidates for a sale. As I sorted through the clothes, I realized I was putting more pieces back in the bin than I was pulling out. Every time I looked at a little striped romper or tiny velcro sandals, all I could see was my sweet baby Junius. It was the outfit he wore on his first day of preschool, the swimsuit he wore for his first trip to the beach, the shoes he wore when he started walking on his own. I was amazed at how many things I'd forgotten that came rushing back, the clothes serving as photo reminders of how much he's grown. Keeping the clothes makes no sense, but somehow giving them away started to feel like letting go of my baby. And that's exactly what I have to do. He's trying so hard to be big -- writing his name (or at least a backwards "jumpin J"), riding his bike, using the potty, sleeping through the night (thank goodness!) -- and it's my job to help him, even if that just means getting out of the way. Even though it's scary sometimes, it's also exciting to watch him grow. And keeping his baby clothes isn't going to slow anything down. The clothes he's wearing these days aren't likely to make it as hand-me-downs -- his jeans have holes in the knees and his shoes are so stinky that I have to keep them outside. So I will keep just a few favorites from those crazy baby days and let go of the rest. Who knows? Maybe one day I'll have a grandson who can wear that seersucker onesie from Junius' first portrait -- it's the one that my mother-in-law saved from when my husband was a baby. Guess I'm not the only mommy who had trouble letting go of her baby boy. To call it a stomach bug would make it sound small and cute and easily squashed. It was none of those things. This was an evil nasty virus that grabbed hold of my body last week and would not let go. After eight straight hours of losing everything I'd eaten and then some, I finally collapsed into sleep. 1. The worst seemed to be over. 2. I had my mommy to take care of me. There's nothing like getting sick to make you want your mommy -- and I was lucky enough to be staying with mine. During the night, my mother (and my father, to his credit) got up to check on me, bring me a clean wash-cloth, offer me water. And in the morning (and for the next two days), my parents took care of my children so I could sleep. If I hadn't been visiting my parents when all this broke loose, there would not have been time for sleep. Instead, it would have been time to come downstairs with the kids, make breakfast, pack Juni's lunch, and get us all dressed to take Juni to preschool, then come home and find ways to entertain Pippi. Thankfully I have a wonderful husband, who would have wanted to help -- but he has his own full-time job and would have needed to get to the office. This was my first time getting really sick since I became a mom. As I healed (very) slowly over the next few days, I kept thinking about how I would have survived if I hadn't had my parents to help me. I'm sure it would have involved lots of toddler videos and a crabby baby -- and a mama who was desperate to sleep. It wouldn't have been the end of the world, but it might have felt like it. Meanwhile, thousands (probably millions?) of mothers all over the world are coping with illness and worse without any support system to give them a break. They struggle to keep their children safe or to meet their basic needs without the time or energy or ability to stop and take care of themselves. I hate that I can't send myself -- or my mom -- to help each of them. So instead I'm reminding all my friends in town to call on me when they need help. Hopefully I haven't passed along my virus to anyone else, but I can at least share my time and support for another mom in need. It's a small thank-you to my own mom and reminder of how lucky I am.